Now get iPage Essential Hosting Plan at a special promotional price of $1.99 per month. Also get a free domain name for 1 year. To get this iPage discount deal, Click on the link below. iPage is one of the best budget web hosting companies. It specializes in shared web hosting space, with decent offerings in VPS and Dedicated server niche. Though iPage has ventured into managed wordpress hosting solutions also, it is yet to gain ground in this space. The company has put together an impressive range of features in its single shared hosting plan, called iPage Essential plan. This is an unlimited hosting plan with 3 website building tools (including Weebly & goMobi), 1-click website installs (WordPress, Joomla, Drupal etc. ), free marketing credits, analytical tools, ecommerce store features etc. A full security suite and 24/7 customer support via email, phone and live chat is also provided. With a great price-performance advantage and anytime money back guarantee, iPage makes for an excellent web hosting choice. Keeping first time site owners in mind, iPage offers regular discounts and sales promotions that help them to kick start their projects at very cheap hosting prices. Right now, iPage is running an introductory offer of $1.99 a month hosting for our visitors. This is the best price that any iPage coupon code on the web can get you. Since, the standard rate of their shared hosting plan is $11.95/mo, you save around 85% OFF with this iPage discount offer. Moreover, you get a free domain name for first year of your hosting subscription. This adds another $15 to your savings. You can activate this iPage deal by following the link below. It will take you to ipage official website and activate $1.99/mo discounted pricing. No coupon code will need to be entered. Please refer to the step-by-step sign up instructions below on how to use our iPage coupon. Please note that the special price of $1.99/mo is only an introductory offer for new customers and therefore applicable for first invoice. Post the initial term, customers have to pay full price at the time of renewal. So, we suggest that you lock in hosting for longest billing term to enjoy highest savings. Click on the “Claim Our iPage Promo” button above or any other special link on this page. It will open ipage website in a new tab/page and activate the iPage discount price for you. You may continue to reference these instructions, as you sign up on ipage.com. Click on the “Sign Up Now” button to initiate the sign up process. a. If you want to buy a new domain name, check the “Register a new domain” radio buton. Then enter the domain name in the box provided and click on “Check Availability” button. Since, ipage offers a free domain registration for 1 year, it is a great time to grab a domain name of your choice and save around $15. b. If you wish to use an existing domain name, just select the “I plan to use a domain I already own” radio button. Then enter the domain you will use in the space provided and click “Continue” button. On the next page, you will be asked to provide your Contact Information billing details and choose any extra services. Start by entering your contact details. It includes your name, postal address, email address and phone number. The email address you provide here will be used the company for sending out email to you with login details. After entering the contact information, scroll below to the Payment Information section. Here you will choose your mode of payment – Credit Card or Paypal and provide the necessary card details. Underneath that, is the section for Purchase Information. Here you will choose the billing cycle for your hosting plan – 1 year, 2 years or 3 years. We suggest you choose 2 or 3 years to avail maximum benefits of initial price cut. You will see that domain registration, set up fee and instant activation are included for free. Uncheck Domain Privacy if you do not want this service. Scroll further below to choose extra add-on services for your hosting account, like, WP Essential, Constant Contact, Google Apps for Work, Site Protection, and Daily Backups etc. Make sure to check or uncheck the boxes for the add-ons as necessary. Next review the Terms of Service, cancellation Policy etc., verify your order total value and when you are ready to make the purchase, click on “Check Out” button. When you complete the payment, your account will be activated and you will be set to create your website with iPage hosting. No, iPage does not offer month-to-month billing cycle. You will need to purchase a minimum of 12 months hosting plan. What billing cycles does iPage offer? iPage offers 3 billing periods – 12 months, 24 months and 36 months. You will need to pay upfront for the full billing term that you choose and upon expiry of the initial term, your hosting plan will renew for the same term length, unless you contact iPage for a change in billing contract. What payment methods can I use for purchasing iPage hosting? iPage offers 3 payment methods to its customers – Credit Cards, Debit Cards and PayPal. The accepted credit/debit cards include Visa, American Express, Master Card and Discover. Does iPage accept payment by PayPal? Yes, iPage accepts PayPal payments. Is the iPage renewal price higher than the initial price that I pay? Ipage offers special promotions and one-time discounts for new customers that are valid only on the first invoice. These are not applicable on successive renewals. Hence, the initial price that you pay will be much lower than what you will need to pay later after the expiry of your first billing term. However, you can grab the best discount by signing up for the longest billing contract available i.e. 36 months. Since, iPage offers one free domain registration for 1 year of your hosting subscription; you will not need to pay any charges if you register a domain name with iPage at the time of hosting sign up. After first year the domain name will be renewed at regular rates, which vary depending on the domain extension used. The most popular .com or .org domains cost $14.99 a year. If you buy any additional domains, you will need to pay at the same rate. If I already own a domain name, Can I use that to register with Hostpapa? Yes, at the time of hosting signup, you will be given a choice to register a new domain name or use an existing domain name that you own. You could either transfer your existing domain to iPage or keep it with the current registrar and just use it with iPage hosting. Does iPage charge any setup fees? No, iPage does not charge and set up or activation fee from the customers. Does iPage offer a money back guarantee? iPage offers anytime money back guarantee. If a hosting account is cancelled within first 30 days and refund requested, the customer can get full refund. After 30 days also, account can be terminated and refund requested. But in this case iPage charges an early cancellation fee. The cost of domain registration and add-on services bought with hosting are deducted at the time of issue of refund. How long does it take for Hostpapa to set up my account after I make the payment? The account set up and activation process is completed within minutes of payment processing. You will receive an email with login details on the email address provided in the contact information form during hosting signup. Does iPage offer Website Transfer Service? Unfortunately, iPage does not support automatic transfer of your website, so you will need to do it manually. iPage does provide several tutorials and guides to help you easily transfer your domain name or complete websites (include files and databases) to iPage server. 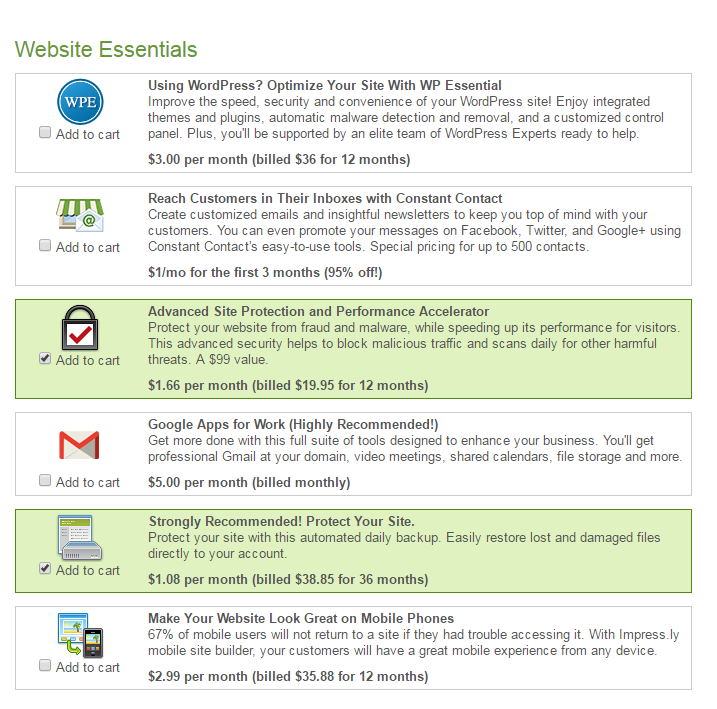 What is WP Essential? Should I buy it? These are good features but can be achieved for free or at lower price alternatives. If you are ready to research and invest a little time and energy yourself, you can easily avoid spending money on this service. But if you would not want to bother yourself about dealing with technical aspects and security of your website yourself, this service is worth a buy. What is iPage’s Constant Contact? Constant Contact is a third-party web based email marketing solution. It includes very easy to use wizard to create email newsletters and manage email lists. In addition to features for creating and organizing email lists, it has several powerful tools for email tracking & reporting and promotion on facebook, twitter and Google+. Though normally, pricing for Constant Contact starts at around $20/month, iPage offers this service for trial at $1/mo for initial 3 months. What is Advanced Site Protection service offered by iPage? This is essentially SiteLock Security service offered by iPage at $1.66/mo (or $19.95 for a year). It scans your website daily for any malware or virus or other security threats. This helps you to protect your website and take any necessary action before your website is blocked by search engines. SiteLock’s firewall blocks any harmful hacks or automated attacks on your website. Does ipage offer automated website backup? iPage offers automated site backup service. But unlike, several other web hosts, this service is not offered for free but at a monthly price of $1.08 (billed $38.85 for 3 years). It will automatically take daily backup of your website files and databases. You can yourself create a backup copy of your website using the tool and restore any version from the system backups with a single click. You can also download the backup files locally.